During the night from 14 to 15 june, an upgrade of the 4Visions WordPress platform is planned. Please be aware your 4Visions site will be unavailable around midnight for a short time. The system will be upgraded to the latest version of WordPress which holds some performance improvements and new functions as can be seen on the video. In preparation of the upgrade, a full backup of the platform will be made for restoration in case of contingency issues. After the upgrade, certain websites will be checked for inconsistencies. But it will not be possible to check every website, page or specific site functionality so if you run into any malfunctions after the upgrade, please let us know immediately. Thank you for your understanding.During the night from 14 to 15 June, an upgrade of the 4Visions WordPress platform is planned. 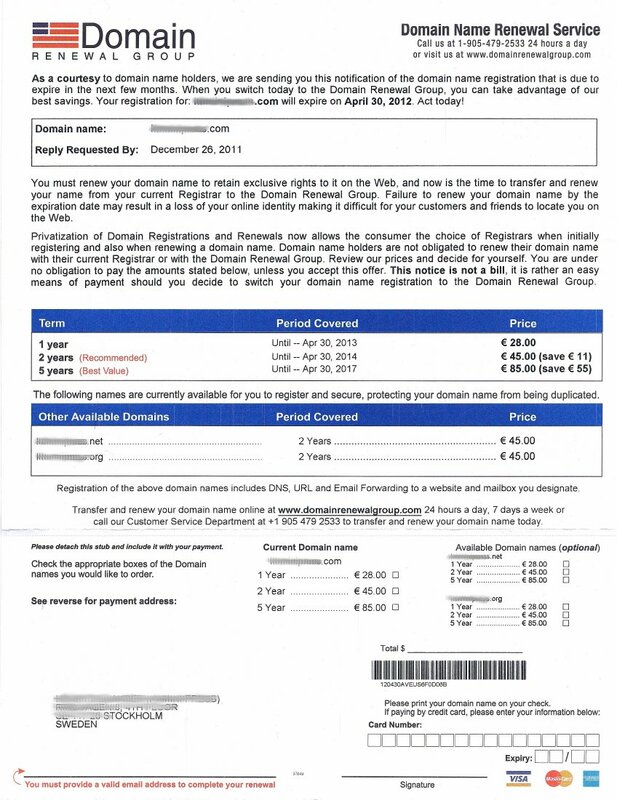 You might (yearly) receive this Domain Name Renewal Service letter that looks like a bill for the renewal of your domain name registration. Sender is the Domain Renewal Group from New York or London. The letter says your domain name is up for renewal and if you do not act quickly, you risk losing the domain. Subsequently, you are offered the choice between renewal for 1, 2 or 5 year terms and you are asked to fill out your credit card number, e-mail address and signature. There is even a return envelope included to make it all as easy as possible. This entry was posted in Hosting and tagged domain names on 5 December 2011 by RavanH.